This sweet cream cheese product is a twist on the ordinary. Cranberry sauce and cream cheese product combine to make a sweet and simple spread for your favourite cookies - a perfect afternoon snack! 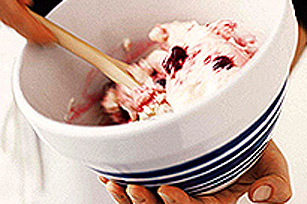 Stir in a few spoonfuls Brandied Cranberry Sauce to a tub (250 g) of PHILADELPHIA Cream Cheese Product until well blended. Try with PEAK FREANS Digestive Biscuits. Place 4 cups fresh or frozen cranberries in 9 x 13 in. baking dish. Sprinkle evenly with 2 cups sugar. Cover and bake at 300°F for 1 hr. Remove from oven. Stir carefully, then stir in 1/3 cup brandy or orange juice. Pour into jars or serving dishes. Store in refrigerator up to 3 weeks.